Learning Herbs* sell a number of herb related products, including some foraging guides for the USA. They also have a free herbal course. Just couldn't wait to take the photo without taking a bite first. 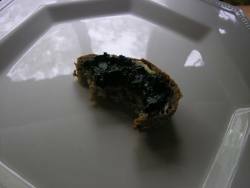 This post is a little out of season, but if you have some dried wild garlic and nettles (or any other herbs for that matter), and would like a recipe for a tasty way of consuming spirulina powder, a rule-of-thumb basic recipe follows below. The combination may sound weird, but it tastes great in my opinion, and some of the ingredients are quite strong in taste and disguise the odd spirulina flavour. This gunk can be made thick enough as a sandwich spread, or thinned down as a dip or salad dressing. Mmm, I'm off to make some and have a sandwich.